I was driving in the county and noticed the sky reflected in a pond in the middle of a pasture. There were a lot of cows around and I thought it would make a nice picture, so I turned the car around and went back and pulled over to the side of the road. As soon as I got there the cows ran off and by the time I got my camera out, there was just the pond and a cloud or two. I walked down the fence line a bit and found a place where I could see some of the blue pond showing through the trees, which I thought would turn out nice. I tried some different focal lengths and decided that I would create a panorama at the maximum focal length of my lens so the pond wouldn’t looks so small. I didn’t feel like getting the heavy 200mm lens out of the bag, but perhaps I should have. I held the exposure lock for each photo to try to avoid exposure problems in stitching. I also applied the lens correction filter in Lightroom to try to get rid of the vignette, but it was not entirely successful. If you look at the sky, you can see the evidence of the vignette problem. Lesson learned: I should have used a smaller aperture to reduce the amount of vignette. I also set the exposure compensation to +0.7 before shooting as I wanted to have room to bring the trees out a bit in Lightroom. This was about 3 hours before sunset and I was worried that the trees would be too dark against the bright scene. I think this worked well enough as I was able to reduce the exposure of the image and then bring up the shadows a bit so the trees have a bit more definition in the bright image. Anyway, imagine a herd of brown cows in the foreground and a few more clouds in the sky. I guess I could try to photoshop all of this in, but that seems like more work than fun to me. This was just an opportunistic photo I took while driving back from a winery out West of Lampasas. A picture from Fiesta Winery; I like the gazebo made from the old silo. What a great way to recycle a silo! Hope you enjoyed the wine. I usually enjoy the wine. My girlfriend likes going to wineries, especially this one, so it is something nice to do on a Sunday afternoon. 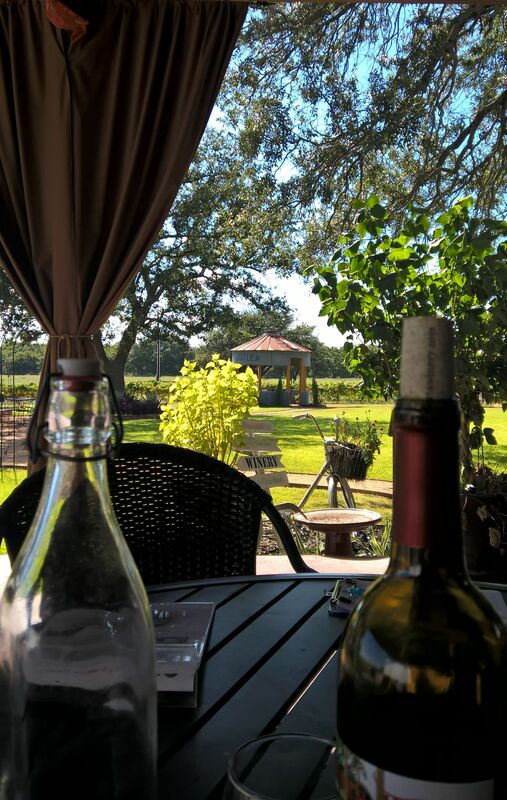 There are quite a few wineries to the West of Austin in the hill country, especially around Fredericksburg. We have never been to one, but the Niagara region here in Ontario is known for them. We will have to add that to our bucket list! I have driven through Ontario a couple of times, but I never had time to do anything but business on those trips. Sometimes it is easier to fly to Buffalo, rent a car, and then drive across the border crossing than fly into Toronto. That’s funny, our saying here is that it is cheaper to fly to the Buffalo to watch our Toronto Maple Leafs NHL team play, than to drive the hour and pay for a ticket in Toronto. Thanks for sharing what you did in order to get this photo! I enjoy learning new lingo, especially from the photog-world! I want to eventually get into photography, perhaps next year when the funds and time allows for it. Anyways, I enjoyed reading the article; hope you enjoyed your time at the winery out of west Lampasas :)! I try to make the point of my writing this blog to be discussing how I composed the photo, the light, the camera techniques and settings and then post-processing as I am trying to learn and improve in this area. I think that writing about it forces me to form coherent thoughts about all of this and helps me to learn. No problem, reinstating through writing is definitely a good way of remembering how you did certain things. Photography seems vastly complex at first, but after doing a little more research, it seems comprehensible.